In eighteen years as a cop on the beat Alfie Moore ‘has seen it all’ so, in addition to all that policing knowledge and experience, he has a wealth of hilarious stories you just couldn’t make up. 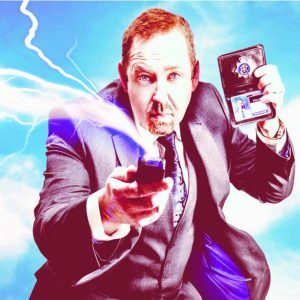 His BBC Radio 4 Comedy series IT’S A FAIR COP is the perfect vehicle for Alfie to skilfully blend succinct layman explanations about the law, with very funny anecdotes from his own policing experiences, whilst taking the audience through a real-life scenario with which he has dealt. Want to listen to Alfie and judge for yourself? No time to read the whole page? Then please skip to the bottom of the page for some ‘snapshot’ audio clips. The premise of IT’S A FAIR COP is that Alfie ‘swears in’ the audience as police officers for the night and, as the scenario unfolds, they are challenged by the real moral dilemmas that police officers on the street face every day and invited to say what real-time decisions they would have made. Often with unexpected and entertaining results! Series 3 explored a variety of everyday policing issues with episode 1 introducing ‘Barry the Burglar’ and episode 2, ‘Punching Judy’, highlighting how upholding the law can be a risky business with increasing numbers of officers attacked each week – and not just by men! Episode 3 covered the thorny issue of wasting police time in ‘Cedric the Gnome’ and in the series finale, ‘Collision Decision’, Alfie took the audience through a road traffic collision which had tested his Fair Cop integrity and powers of discretion to the limit. As always the studio audience were true co-stars of the shows as they gamely shared their thoughts and hilarious experiences. 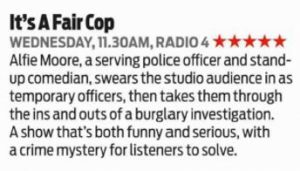 In September 2018 ‘Fair Cop’ Alfie returned to his Radio 4 beat, with 5 brand new episodes. Alfie shared the heartwarming story of a robbery chase with his canine partner Zeus (The Wrath of Zeus) and the frustrating but funny neighbourhood dispute (Hedgerow Hedge Row). This series also tackled the sensitive emotive topics of sexual misconduct (Office Banter), mental health issues in the context of balancing ‘protection’ with ‘intrusion’ (Pass the Person) and an increasingly desperate search for a missing person (Misper Mervyn) – challenging subjects for the ‘comedy slot’ but Alfie’s compassion and genuine concern made it work. Missed a show? Or loved it so much you want to listen again? They can also be heard on the BBC iPlayer for one month after broadcast. Not got long? For a quick ‘Humour Fix’ try one of the clips below…. Listen to an excerpt from ‘Collision Decision’ – where Alfie explores the most broken law in Britain – The Road Traffic Act 1988. Listen to an excerpt from ‘Punching Judy’ – The one where Alfie finds himself in a bizarre ‘Enter the Dragon’ scenario…..